In this era of technology our way of living has changed altogether. We are much advanced, more sophisticated and quicker to do our work. Every other day we get to know some new invention or some new products launched in tech world. This is not going to get over as the competition and our demands are growing. Life has become robotic. We think about technology, we work on technology and we live on technology. In fact its hard to live a life without technological products. Using something in limit is always good but when one uses it beyond the limits then it may start creating issues and that’s what is happening with us right now. We are moving in a technological triangle most of the time especially the young generation. Our mornings start with updating “Good Morning” status on Facebook and sending text messages to bulk of friends. Our evenings are spent in front of televisions and our nights in front of laptop and internet. In schools, colleges, universities most of us are busy talking or texting on phones and even during the lectures. Same is going on in offices. If one gets a chance to use internet anywhere the first thing he/she will be doing is to log-in on Facebook. All these things not only hurt our productivity but also put a question mark on our social values. If one gets free from texting or talking from cell phone then he/she switches on television and after that may come the laptop. On average we spend 80% of our time with these technology oriented gadgets. Our socialization is becoming less. We don’t have knowledge about our neighbors and colleagues. We like to ask how one is feeling through Facebook or through texting but don’t like to walk to that person for a single minute. We don’t have time to spend with our family but we do have time to talk with our girl friends. We don’t have time to offer prayer but we do have time to watch television. We don’t have time read a book but we do have time to use Facebook. As a result of all this we are getting away from our core social values, in fact we are becoming robots. The need of the hour is to bring a balance in our life. We should use all these things but we should take time out to get to do our socializing, sports and spend time with family and friends. We should give ample time to all the things. In this way we will be able to get more positive results and we will be more successful in our lives. btw what’s the point of this article? The point of this article is for those who are left with little bit sense which unfortunately you are not. Get some sense and then read it again. comparing to other nations of the world, we are century behind, but still peoples lives in the urban arena tied with the mentioned triangle. Tottaly agree with last Paragraph..
Just watched this video and thought that this video beautifully explain the idea of my this post. Thanks a lot and it I am so happy to see that thoughts are getting changed. 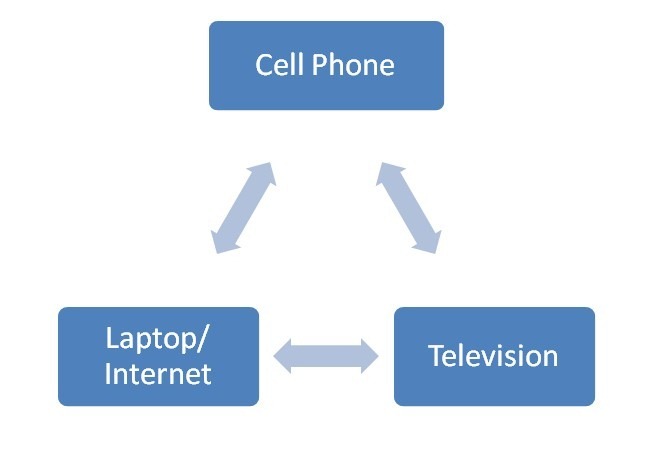 on the Lighter note: JUST BRING 3G or 4G Technology in Pak so that ppl could’ve Only CELL-phone in their hands to WATCH TV or use INTERWEB, may be then they could spend the remainder of their “LEISURE TIME” in healthy Activities….